Mr Selekeowei Olokumo, obviously a wicked parent in Bayelsa state has been alleged to have kept their 16 year old daughter in a cage for three years because she suffered from convulsion. 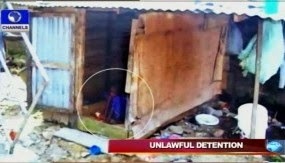 According to Channels Television, a regular visitor to the home of Mr Selekeowei Olokumo, in Yenagoa, Bayelsa State, Nigeria’s South-South region, would probably have noticed a small make shift building directly opposite his one bedroom apartment which could easily be mistaken for a generator cage. To think it is a place where he stores his old and worn out property would not be out of place, as it was haphazardly built with wood and carton on what could be seen as a semi refuse dump site. It was a feeling of shock when Channels Television realised that it was not for keeping his generator or other items but where his 16-year old daughter, Blessing Olokumo, had called home for almost three years. Blessing is the 6th out of the 16 children of Mr and Mrs Olokumo; a twin who has no relationship with her twin sister, not because her twin sister was dead. she is simply ashamed of being associated with her. She is not leprous, neither is she affected by any contagious disease. She is just a child who had convulsion when she was three years old and was not properly monitored by the medical doctors, so instead of outgrowing it as most children of her age would probably have done, she has since been battling with the condition. One would expect her parents to be sympathetic to her plight and treat her with more care and attention, but the reverse has been the case, as Blessing is being treated with utmost disdain by those who are supposed to love her more. She has been tagged the evil child, accused of being responsible for the death of her immediate siblings who were also twin girls. She has been abandoned by her parents in a cage for almost three years and left to God to decide her fate. Luck smiled on Blessing when members of the Mary Slessor Twin Foundation, a foundation focused on the welfare of people of multiple birth heard of her plight and decided to intervene. She was rescued on January 25, 2014 in a very bad condition and has since been on admission at the Niger Delta Teaching Hospital, Okolobiri. Blessing’s father, a security guard at the Niger Delta Teaching Hospital, Okolobiri was asked how he could do such to his flesh and blood. He simply stated without remorse that he was tired of looking after the girl. “Why I kept her in this house is that when she defecates and urinates, she soils the whole house when the mother and myself are not around. So there’s nothing I can do again. I now isolated her from the apartment I’m living”, he said. While one may be tempted to call her dad wicked, heartless and much more, one wonders what words would be adequate to describe her mother, Mrs Bernice Olokumo, a petty trader, who accused her daughter of being responsible for the death of her younger siblings who were also twin girls. On her relationship with her daughter, she simply said she was afraid of her and appeals to the Government and other people of goodwill to come take Blessing from them, as they were tired of fending for their own child. To ascertain the present condition of Blessing, Channels Television paid her a visit at the hospital and met a transformed girl. Gone were the tiny frame, bony knee and sunken eyes. A cheerful, robust and well fed child was what she had become, after just three months of love and care. On the way forward regarding her medical bills and her future, efforts to speak with the doctors proved futile, but the President of the Mary Slessor Twin Foundation, Mr Ebitei Roberts, spoke. The foundation has since lodged a formal complaint with the Police and the welfare department of the State Ministry of Women Affairs. The complaints list criminal charges of child abduction, inhuman treatment, child molestation and failure to enroll a child for proper education.